Just after 4pm, the phones started ringing at the Royal Observatory on Blackford Hill. Caller after caller reported seeing the sun. The date was September 27, 1950, and the place was Edinburgh, Scotland. Seeing the sun in Scotland can be a bit of a rarity, but even the Scots knew that the sun should not look like this. Over a quarter of an hour, the sun had turned bright blue, while the sky took on a bronze colour. The Scotsman reported “All over Edinburgh, on the streets and in suburban districts, people stopped to gaze at the sapphire sphere shining in a greyish-white sky.” The Astronomer Royal requested an airplane to investigate. Above 10 kilometer altitude, the sun was its usual yellow. Below that, it was distinctly blue. In between, a layer of smoke seemed present. The phenomenon lasted until 6:30pm when the sun regained its normal hue. But later that evening, when the moon rose, it too was blue. A young Patrick Moore wrote “The moon was in a slightly misty sky and had a kind of lovely blue colour comparable to the electric glow discharge. I never saw something similar before.” Indeed, nothing like it had been seen since the blue sun of August 18, 1821 had appeared in the skies of southern England. The cause of the 1950 discolouration was across the Atlantic, in Alberta, Canada. A forest fire had been burning there since June but it had largely been left alone: fire fighters were told to only tackle fires within 10 miles of a town. By September, the deflagration had become huge and late September, the sun over eastern Canada went out, hidden behind the dense smoke. The Chinchaga firestorm had grown into the biggest wildfire on record in North America (it still is). The smoke particles blew over the Atlantic, and when the haze reached the UK, the sun turned blue. Whilst blue suns are very rare, red suns are more common. In October 2017, as the UK was hit by a post-tropical hurricane, the sky went yellow and the sun red. It was quite an amazing sight. It was also amazing to see the students just looking down at their phones, rather than up at the sky. Perhaps in their on-line world, the colour of the sun is of no particular interest. We can teach our students to think, but it has become harder to teach them to see. The red sun was caused by a combination of dust from the Sahara and smoke from forest fires in Portugal, caught by the hurricane. Red suns amidst hazy skies had also been a feature of the dry fogs of the Laki eruption, in 1783. But the most famous instant of strangely coloured suns happened in 1883, when the eruption of Krakatoa painted the sky world-wide in unworldly colours. Let’s have a look. The eruption had been a terrible one. Captain Watson of the ship Charles Ball was in the vicinity, and he wrote a vivid account of the events. “The night was a fearful one: the blinding fall of sand and stones, the intense blackness above and around us, broken only by the incessant glare of varied kinds of lightning, and the continued explosive roars of Krakatoa made our situation a truly awful one. “At eleven P.M., having stood off from the Java shore, with the wind strong from the S. W., the island, being W. N. W. distant eleven miles, became visible. Chains of fire appeared to ascend and descend between it and the sky, while on the S. W. end there seemed to be a continued roll of balls of white fire. The wind, though strong, was hot and choking, sulphurous, with a smell as of burning cinders, some of the pieces falling on us being like iron cinders. The lead came up from the bottom at thirty fathoms quite warm. “At 11.15 [a.m] there was a fearful explosion in the direction of Krakatoa, then over thirty miles distant. We saw a wave rush right on to the Button island, apparently sweeping entirely over the southern part, and rising half-way up the north and east sides, fifty or sixty feet, and then continuing on to the Java shore. This was evidently a wave of translation, and not of progression, for it was not felt at the ship. This we saw repeated twice, but the helmsman said he saw it once before we looked. At the same time the sky rapidly covered in; the wind came out strong from S. W. to S., and by 11.30 A. M. we were enclosed in a darkness that might almost be felt; and then commenced a downpour of mud, sand, and I know not what, the ship going N. E. by N. seven knots per hour under three lower topsails. We set the side lights, placed two men on the lookout forward, the mate and second mate on either quarter, and one man washing the mud from the binnacle glass. We had seen two vessels to the N. and N. W. of us before the sky closed in, which added not a little to the anxiety of our position. Soon dust was falling over much of the Indian Ocean. It was the 27th of August 1883, and Indonesia had just lost one of its islands. The explosion had been horrendous, and the death toll terrible. And Krakatoa was only a VEI 6! This was the first significant volcanic eruption, and the first major catastrophe, in the time of instant communication. The Dutch Java Bode published the stories on the same day of the eruption. English newspapers soon followed. The complete destruction of the town of Anjer was especially newsworthy. Even with the new telegraph links, the confirmed information could still be limited. ”All gone. Plenty lives lost”, read the content of one such message, leaving the journalists with some creative writing to be done. They rose to the challenge. San Jose Weekly Mercury, 6 Sept 1883. The 16 active, towering new volcanoes formed by creative writing. And two weeks after the eruption, on September 9, 1883, north of Borneo, Watson reported that the sun rose perfectly green, and that the moon and the stars gave a green light as well. The strangeness had begun. After the final, destructive Krakatoa explosions, the reports of strangely coloured suns multiplied, and began to spread around the tropics. The first report was already on Aug 27, from a small region in Sri Lanka, where the sun became green. Initially, coppery, silvery, and even a leaden sun were reported. This was closer to Krakatoa and only in the first days, apart from one report from Tokyo on August 30, apparently at the receiving end of a narrow high-altitude air stream. Once the densest dust clouds had dissipated, the other colours began to appear. A blue sun was seen in the northern part of South America, from Panama to Parimaribo, on Sept 2. In Honolulu, on Sept 5, the sun went green. In Sri Lanka, a green sun was seen on Sept 9 and again on Sept 22. The Red Sea had a green sunrise on Sept 10 and a blue sunset on Sept 24. A green sun was seen at the coast of China on Sept 10. Sept 15 saw a green sun over the Atlantic. A blue sun hung over Trinidad on September 2nd, and over Barbados on September 15. The last report of a green sun was on September 28. (There was a final, perhaps unrelated report on January 24, 1884, of a green sun at Cracow.) A coppery sun was seen near the Equator, including on August 31 off the west coast of Africa; at Fanning Island, on September 4, and over the Atlantic on September 7. There are some patterns that can be recognized from the observations. The silvery or pale sun was seen when the sun was highest in the sky, and where the volcanic dust was densest. A coppery sun appeared at larger distances, but mainly along the equator, suggesting the dust was still dense. Blue and green suns were seen furthest from Krakatoa, through thinner, older dust cloud. 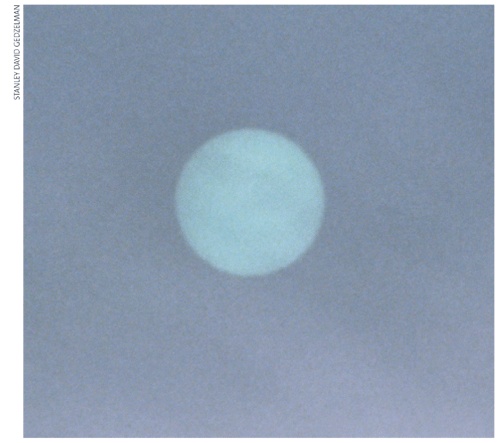 By that time the clouds had become difficult to see: the blue suns were most often seen without recognized clouds. Many observers expressly state that there was no cloud. However, the volcanic cloud was there, as shown by the fact that the sun would be fairly dim at the same time: the blueness was due to the loss of yellow and red light. Typically the sun would be green closest to the horizon, changing to blue 10 to 20 degrees above the horizon. Usually the sky was not red, but white, grey, or blue before a white or blue rising sun, or after a setting sun of white or blue appearance. This suggests that the densest and coarsest dust caused silvery suns, and blue and green suns came from thinner layers with smaller dust particles. These moved around the world from east to west, taking 13 days to complete a circuit. The zone over which it was seen gradually widened over this time. It was not only the sun that was painted in colour. The sky itself seemed on fire. In combination with the coloured suns, one person wrote how the wonder continued into the evening: “After sunset, the rays showed another range of colours: yellow, orange, and finally deep red.” It had started as a haze, immediately following the falls of dust and causing a red glare in the sky. Later, the skies looked white. This was seen over the Indian ocean, within a day of two of the main eruption. The dawn in Mauritius was crimson. On St Helena, on August 30 a red light was seen in the south. South of the equator the skies were mainly hazy and blue suns were rare or absent. A few days later, the skies went white, and later yellow. The spectacular twilight colours came after the densest dust had settled. The glows reached Cape Town on September 20, indicating that the dust band were gradually widening. From October 1, the brilliant colours expanded north, reaching places as diverse as Shanghai and Florida, mirroring those in Australia and New Zealand. Been hurl’d so high they ranged about the globe? Sadly, even though photography existed, that was only in black and white, leaving the painters and writers with a monopoly on colour. The main painter giving it a go was William Ascroft who watched from the banks of the Thames. The reds and yellows in his paintings give a good indication of the spectacle. “it was as if a flaming sword of blood slashed open the vault of heaven,” he recalled; “the atmosphere turned to blood – with glaring tongues of fire – the hills became deep blue – the fjord shaded into cold blue – among the yellow and red colours – that garish blood-red – on the road – and the railing – my companions’ faces became yellow-white – I felt something like a great scream – and truly I heard a great scream.” And that is what he painted, complete with the fiery red background. Although the glows continued, from January the brightness declined, and in the UK by April only faint traces remained. In addition to the coloured skies, the general haze which had started immediately after the explosions, remained present. It had a strong effect: the sun was surrounded by a glow, a corona extending some 30 degrees. In January 1884, a UK observer wrote about this “It has been visible on every clear day for more than two months, and has been quite independent of wind and weather.” The haze continued for longer than the twilight colours. The final report was in Oct 1886, when it briefly re-appeared after a summer absence. After this the skies had completely cleared.. The corona is named Bishop’s ring, after Rev. Bishop in Honolulu who had first described it, on 5 Sept 1883. It seemed unrelated to the colours of the sky: the corona had always the same whitish appearance. But it was not seen from the big cities, London and Berlin, and this was attributed to the smoke which hung over these cities. The spectacular sunsets were due to volcanic dust clouds at very high altitude. Different observers found different heights, with 15-20 kilometers commonly derived. But the height appears to have been decreasing from November 1883, at a rate of 1500-3000 meters per month. Dry fogs and sulphate hazes of course had happened before. Laki, in 1783, had caused white skies and powerless sunshine for a full summer. The haze had extended from the sea-level to an elevation higher than the tops of the Alps. But the amazing colours were missing. The layer may have been too low in altitude: if it had been over 10 kilometers, the brilliant Krakatoa sunsets may have been expected. In the winter of 1885 the twilight colours re-appeared, albeit much fainter than before. A second re-appearance was in the following winter. After that, the world had returned to its pre-Krakatoa state – minus one island. The coloured suns and related phenomena revealed something that had been unknown before: a high level tropical jet which catapults air around the globe from east to west. The effects allowed the speed of this jet to be measured. For instance in Sri Lanka (Ceylon), the coloured sun was first seen on August 27. After that, it appeared on September 9 to 12, and 22 to 24. The intervals from August 27 to September 9 and from September to 22 are both thirteen days. Krakatoa beat Phileas Fogg by 67 days, at an average speed of around 130 km/h. This period of 13 days was seen in many places in the tropics during September. During the first circuit, the cloud expanded to the region between 22 degrees north and 33 degrees south, or about 28 degrees from the latitude of Krakatoa in both directions. The spread away from the equator happened at 10 km/h. During the second transit, the cloud added about 10 degrees latitude, at 3 km/h. There is an easterly tropical jet crossing the Indian Ocean, at 10-15 kilometer altitude, running at the right speed. It is driven in part by the Indian monsoon, and reaches speeds of 140 km/h. It is seasonal, and is strong from June to September. The Krakatoa eruption occurred during its peak, and this contributed to the spread of the coloured suns. It would have been a different story had Krakatoa erupted in November. Krakatoa is not unique in its colouring of the skies. A mini-Krakatoa appears to have happened half a century earlier. In September 1831, brilliant orange and red sunsets were seen throughout southern Europe, and the sun had the dead brilliancy of the moon. It had started earlier. The first reports were of haze and blue sun on August 3, from the coast of Africa. A few days later it reached Odessa and southern France here the sun went green and azure. The US was impacted from August 13, and New York had its blue sun on August 15; the Bermudas had had a preview on August 11. The light of the sun was so much diminished that it was possible to observe its disc all day with the unprotected eye. On the coast of Africa the sun became visible only after passing an altitude of 15° or 20°. The sky was never dark at night, and at midnight, even in August, small print could be read in Siberia, Berlin, and Genoa. The time fits with the appearance of Graham Island, off Sicily, on August 1, but it seems surprising that this eruption was major enough to impact New York. It is always worth looking up. There is no telling what you might see! That blue sun in a yellow sky may reflect a distant volcano. 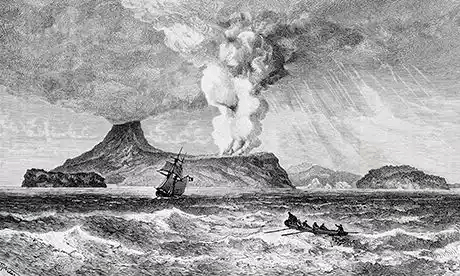 Most of the excerpts are taken from: the Royal Society (Great Britain) report of the Krakatoa Committee: “The eruption of Krakatoa, and subsequent phenomena.”, available from Gutenberg. Slightly OT, but closer to home…. Twice in a row, our beloved friend Stromboli experienced a bout of hiccuping. What’s happening there? Doesn’t seem to be clogged up as strombolian activity is keeping its pace between the blasts…. Question: are there any other bigger bubbles on the way to the surface? This could spell disaster to anyone watching the activity from the observation points, with or without guide…. Anybody stuck there during one of these paroxysms would be caught in a hail of blocks and bombs, possible pyroclastic flows or directed explosions, with slim to none chances of making it out alive. 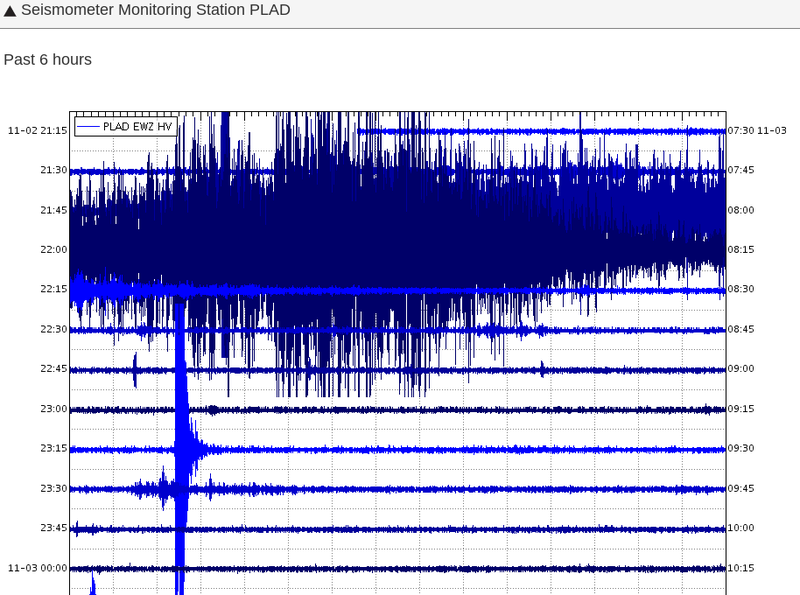 This signal shows quite well on the rest of the seismometers, especially the east/southeast side of the island. Shows a little on the west side of the island. The southwest rift it is having a noisy patch. I remember when the hole covered populated regions and you had be careful in september (early spring). In fact, the hole at times reached Scotland. Due to an unfortunate Friday, I wound up on backroads trying to find a way across the bay to get home this afternoon. As part of that journey, I wound up in Blackwater State Forest. Note the wooded area to the right of the road. It recently had what appeared to be a controlled burn. The area on the left of the road was unburnt. Controlled burns go a long way towards thinning the underbrush and preventing out of control wildfires should the flame reach the canopy. Canopy fires can easily generate enough heat to sterilize the soil, making it pretty difficult for vegetation to re-establish itself. 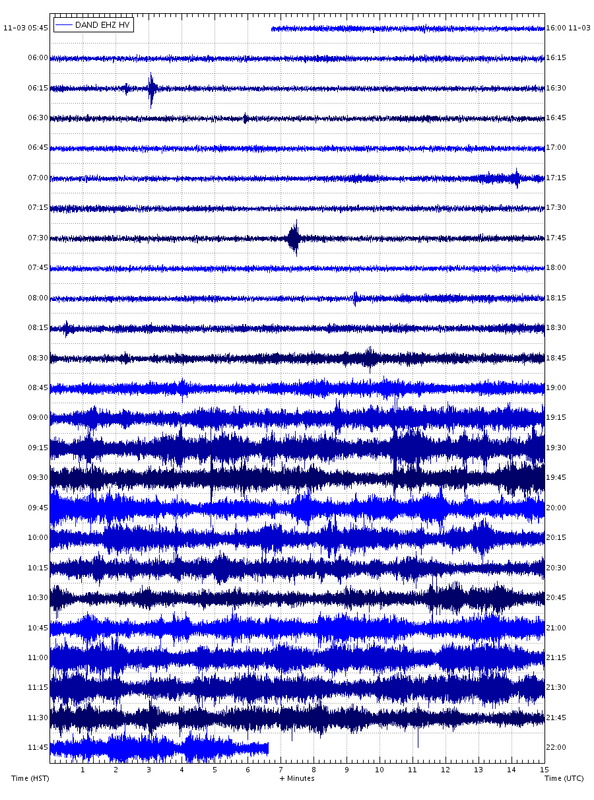 “Seismic activity has been increasing in Öræfajökull volcano in the recent months and the Icelandic Meteorological Office (IMO) has responded by strengthening the surveillance in the area. In the last week of October, staff from IMO installed two new seismic stations near the glacier Öræfajökull: at Háöxl (Hox), south of the glacier; and at Kvísker (Kvi), on the eastern side of the glacier. In addition earlier in the month, IMO gained access to the seismic station, owned by the British Geological Society, located near Falljökull (Fal), west of Öræfajökull. This station, which was installed for ice-quakes research, has proved to be very beneficial to locate earthquakes in this volcanic area. When looking at long-term changes in the seismicity, activity has been increasing in Öræfajökull since 2016. In June and since early September this year, the activity has increased still further. The new stations are therefore an important addition to the pre-existing monitoring network for improving the sensitivity of the surveillance system. The current seismic network provides better information on the seismicity, it particularly detects small earthquakes (magnitude between M0 and M1), and also allows a better assessment of either location and magnitudes of the earthquakes. There is still considerable uncertainty in the depths of the earthquakes, but their seismic waveforms are consistent with a source located in the crust at a few kilometers depth. The 48-hours seismicity is available on the IMO website and updated in real-time. It’s obvious that the new instrumentation has made a difference. A lot of small quakes between M0 and M1 are now detected. Also, now there are deep ones as far down as 18km. It will be interesting to do a new 3D plot in a few weeks or months and see if the new accuracy can reveal something about the plumbing under Öræfajökull. I was reading on Jons site that apparently bardarbunga and grimsvotn, as well as oraefajokull, had all experienced inflation of somewhere about 5 cm. Im curious as to how much magma that amounts to given how big each of the volcanoes is. Also given that north of bardarbunga has already rifted significantly during its last eruption, would it this time be more likely to go south towards the veidivotn area?. I know a rifting event there might be a little way off yet but GVP lists the vatnaoldur eruption as happenning in 870 AD, which was less than 100 years before eldgja a little bit to the east, and its been about 450 years since the 1477 eruption there. I know it was two different volcanoes, but laki was also not from bardarbunga so things might be getting a bit closer. Is 450 years long enough for that area to be at risk of a similar event now? Im not a noob in this subject but I havent got any real life experience on this sort of stuff yet. And to be honest seeing a flood basalt/rifting fissure event is on my personal bucket list of my life, at least since I found out how truly huge they are compared to the little lava flows in hawaii now anyway. Time for another post. Saving the Earth – but not as we know it.